Prelude to the Big One? There was an era in earth science more than thirty years ago, when earthquake prediction was at the top of the seismological research scale. After some apparent successes in China and other places, seismologists thought they were close to being able to tell the world exactly where and when devastating temblors would occur. Parkfield, a tiny hamlet in central California northeast of Paso Robles, was the epicenter of this research. There, where the San Andreas Fault is so strikingly exposed, dozens of scientists from the US and abroad placed hundreds of sensors into the ground, hoping to catch the latest precursor. Unfortunately, after more than a decade of enormous effort in Parkfield, earthquake prediction proved as elusive as the search for the Midas' touch to turn everything into gold. One of the questions seismologists tried to answer was, if earthquake swarms could be the prelude to a Big One. This hypothesis got some notoriety in the summer of 1975. Six years before, the construction of the Oroville Dam north of Sacramento had been finished and this tallest earthen dam in the US had impounded the Feather River without any problems. But when suddenly in June 1975 earthquakes started to happen under the reservoir, authorities became worried. Would the quakes shake to dam to pieces? However, within a month the swarm had subsided and people breathed a little easier - until August 1, when a quake of magnitude 4.7 shook the dam. Bruce Bolt, then the director of the Berkeley Seismological Laboratory, was asked if there was more to come. He said it was possible and indeed, a few hours later, a magnitude 5.7 quake happened in the area of the swarm. Not only scientists began to ask whether Bolt's statement was a true prediction or if the occurrence of the strong quake under the dam was an untimely coincidence. Even though we seismologists have clearly failed to find any reliable precursor so far, the same question is being asked again today, as it was after the Oroville incident: Is the current earthquake swarm under San Ramon and Danville in the East Bay a prelude to something bigger? Starting with a 0.8 magnitude microquake on October 13, more than 400 temblors have since occurred along the Calaveras Fault under the Crow Canyon Country Club. At least eight of these quakes had magnitudes greater than 3 and were clearly felt all the way to Concord in the North and San Jose to the South. As of this writing, the swarm goes on and on. To say it very clearly: Earthquake swarms are not at all an indicator that something bigger is about to come. Too many times such swarms have happened without culminating in a big, destructive quake. This is especially true for the I-680 corridor. In May a swarm under Concord came and went. 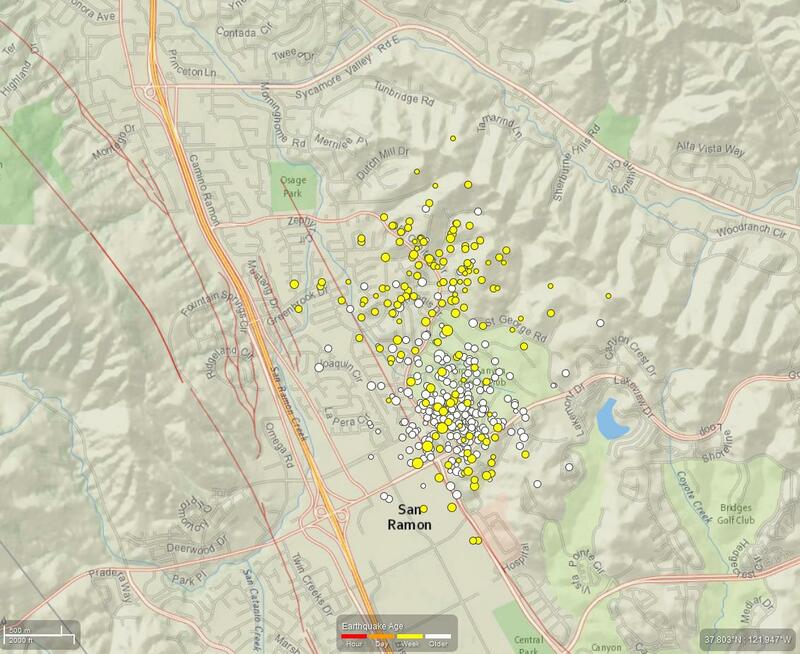 And since 1970 the northern segment of the Calaveras Fault in the region of Alamo, Danville and San Ramon has seen at least four swarms, most recently in 2003. Each lasted for weeks or months, but so far none was closely followed by a significant quake.